The odds are stacked against any Cardinals player hitting an inside-the-park grand slam. Only two Cardinals have achieved the feat since 1963. _ Each of those two inside-the-park grand slams was hit in New York against the Mets. _ Each occurred in the second game of a Sunday doubleheader. _ Each took place on the same date, June 9, 22 years apart. Catcher Tim McCarver hit an inside-the-park grand slam on June 9, 1963, in the Cardinals’ 10-4 victory over the Mets in Game 2 of a doubleheader at the Polo Grounds. Third baseman Terry Pendleton hit an inside-the-park grand slam on June 9, 1985, in the Cardinals’ 8-2 victory over the Mets in Game 2 of a doubleheader at Shea Stadium. Both occurred because of outfield misplays. The Cardinals led, 6-1, in the eighth inning when McCarver came up with the bases loaded and one out against Mets rookie reliever Larry Bearnarth. McCarver lofted a routine fly to center. 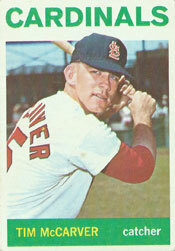 “I was just figuring on a sacrifice fly,” McCarver told The Sporting News. Three big-league catchers have hit inside-the-park grand slams since McCarver did it. They are Jim Essian of the Athletics (June 10, 1979), Ron Karkovice of the White Sox (Aug. 30, 1990) and Dan Wilson of the Mariners (May 3, 1998). Like McCarver, Pendleton was looking to extend a Cardinals lead when he came up against Mets reliever Joe Sambito with the bases loaded and one out in the fifth inning. St. Louis led, 4-0. Pendleton hit Sambito’s first pitch to right-center. Right fielder Danny Heep and center fielder Terry Blocker gave chase. As Blocker and Heep collided, the ball caromed off Blocker’s glove. Becker injured both knees and was carried from the field on a stretcher. “It’s a hell of a way to get a grand slam, isn’t it?” Herzog asked.